For questions and prices, please call our toll free number (800) 225-4788 or send an email to questions@EMAdamsCo.com. Single cotton strap with bound foam cuff. 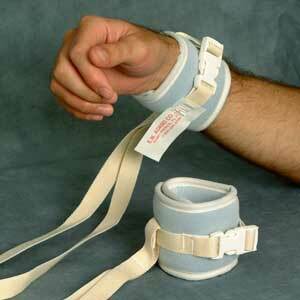 Limb holder cuff is secured with hook and loop fastener and separate strap with a quick release buckle. Limb holder is secured to the bed with a quick release bed-frame strap. No tying is needed with this limb holder. Double cotton strap with bound foam cuff. Limb holder cuff is secured with hook and loop fastener and separate strap with a plastick quick release buckle. 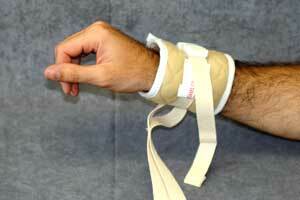 Limb holder is secured to the wrist without tying. Double tie-down straps can be used for 2-point positioning. Single nylon strap with foam cuff. 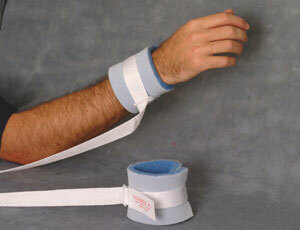 Limb holder cuff is secured with hook and loop fastener and a wave buckle to prevent over-tightening. Provides secure positioning of limb holder. One size first wrist and ankle. Quilted cuff allows for extra comfort. Single cotton strap with quick release loop. 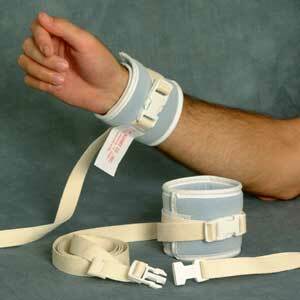 Limb holder cuff is secured with hook and loop fastener and separate strap with a plastick quick release buckle. Limb holder is secured to the bed with quick release bed-frame strap. No tying is needed with this limb holder. With the strength of leather and comfort of a soft restraint, The Tuff Cuff is the perfect choice when a normal soft restraint is not enough, made with a neoprene cuff and extra strong webbing. The wrist and ankle restraints are color coded and washable. Our Polyurethane Limb Holder replaces outdated leather restraints at a reduced cost. Allows easy cleaning to conform to newer JCAHO Protocols. Please contact E.M. Adams Company at our toll free number (800) 225-4788 or via email at questions@EMAdamsCo.com. Contact E.M. Adams Company toll-free (800) 225-4788 or email us at questions@EMAdamsCo.com for more information.